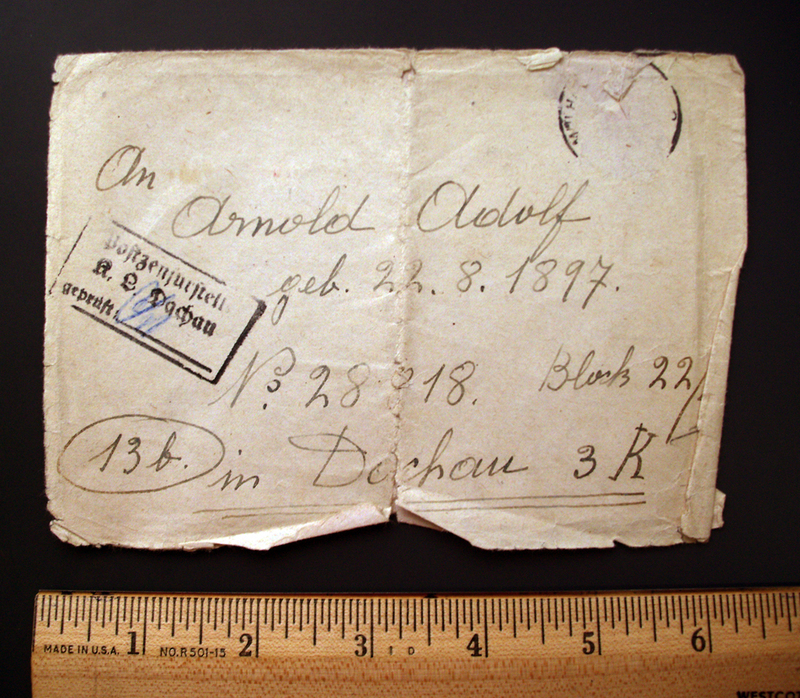 Adolphe Arnold was incarcerated in Dachau Concentration Camp from December 5, 1941, to August 17, 1944, for refusing to denounce his beliefs as a Jehovah’s Witness. Thereafter he was transferred to Mauthausen. 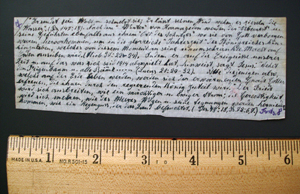 His family wrote regularly and smuggled Scripture passages inside cookies they sent him. 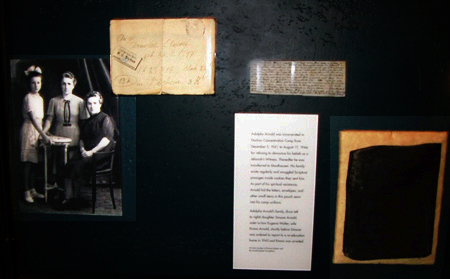 As part of his spiritual resistance, Arnold hid the letters, envelopes, and other small items in this pouch sewn into his camp uniform. Adolphe’s daughter, Simone, was ordered to report to a re-education home in 1943 and his wife, Emma, was arrested. The family was reunited in 1945. Eugenie Walter, Adolphe Arnold’s sister-in-law, smuggled cookie texts in food parcels to Adolphe. At the time Adolphe’s wife, Emma, was also in a camp. 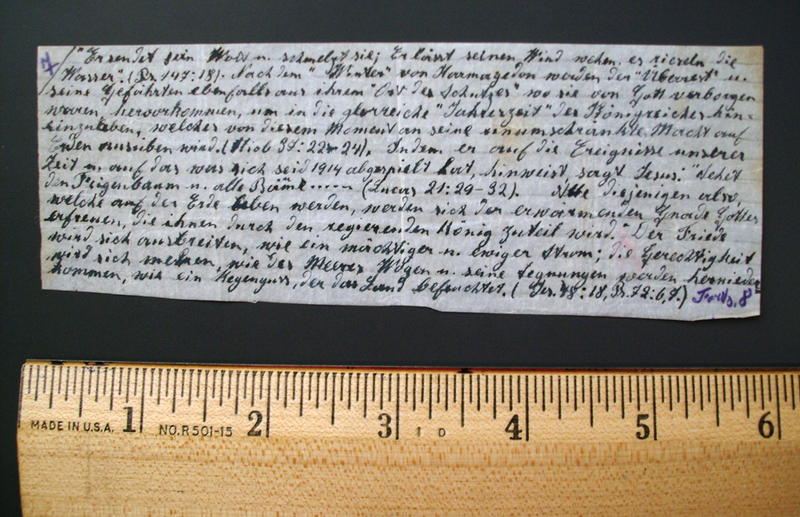 To make a cookie text, excerpts from the Watchtower were written in very small letters on fine paper. The text was rolled up and put between two cookies glued together with Ersatz honey. 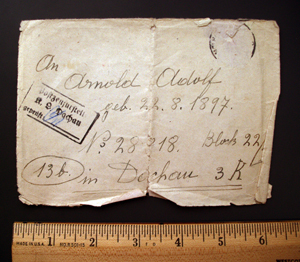 Both the envelope and the cookie text date to the earliest period of camp incarceration, December 5, 1941 – August 17, 1944. Adolphe Arnold made this pouch and sewed it into his concentration camp uniform. In it he kept the cookie texts and letters from his daughter, Simone. After his return home he resewed the pouch into a jacket he wore when he was first arrested by the Gestapo. 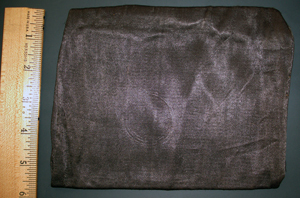 It was not discovered until after Adolphe’s death when the jacket was taken to a dry cleaner.